If exchange is the criterion of generality, theft and gift are those of repetition. There is, therefore, an economic difference between the two. Gilles Deleuze 2Gilles Deleuze, Difference and Repetition, translated by Paul Patton, Columbia University Press, 1995, p.1. MoMA: When Art is Just a Luxury / Art is a Lie. Sotheby’s: Hang Art Not Workers / End Your Lockout. By contrast, the 2012 invasion was carried out by post-studio creatives, that surfeit of young men and women with Masters and Bachelors degrees in fine art who are beginning to recognize a sobering fact: their seemingly privileged place in the economy is not substantially different from the millions of other professional workers who have lost employment since the economic meltdown following the ongoing crisis. In short, they are just more surplus labor gathered like dross within the “jobless recovery.” It is their rapid politicization and active participation in OWS that has generated interest amongst art commentators, as well as a degree of surprise by the many labor and community activists. But whether aware of it or not, this 21st Century art activism follows a pattern, about which more below. And yet somehow, what is happening is also simultaneously new. By way of repetition something is undone, “repeated, the same line is no longer exactly the same, the ring no longer has exactly the same center, the origin has played. 3Derrida, Op cit. And undoubtedly, the center is in play today, again. American artist Tim Rollins once scornfully quipped that the term “political art” conjured-up charcoal sketches of Lenin, and muscular workers with clenched fists. It was the 1980s, but his reference was to the radical proletarian art of 1920s and 1930s often associated with the John Reed Clubs, publications like the New Masses, and the Communist Party USA. Fifty years later Rollins, together with Julie Ault and a dozen other people, co-founded Group Material, a youthful collective of 1980s art school graduates hoping to resurrect the withered spirit of the avant-garde then languishing between the exhausted vocabulary of post-minimalism on one hand, and regressive neo- expressionist painting on the other. 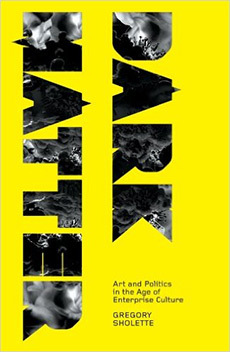 Group Material had no doubt about the connection between art and politics; both were cut from the same cloth of social dissent. Rather, it was social realism, and political propaganda that they dismissed with righteous contempt. The objective of Group Material was to forge links between art and politics and popular culture in a complex, aesthetically engaging way. Nor was Group Material alone in this pursuit. Paper Tiger television, Artists Meeting for Cultural Change (AMCC), Political Art Documentation/Distribution (PAD/D), Artists Against Nuclear Destruction (AAND), and the feminist art collective Carnival Knowledge, were more or less contemporaries with Group Material in New York City during the late 1970s and early 1980s, with the Guerilla Girls, and the anti-AIDS activists Gran Fury emerging mid-decade. Meanwhile, on the West Coast groups such as SPARC (Social and Public Art Resource Center), the San Francisco Poster Brigade, Urban Rats, and Border Arts Workshop represented a similar wave of collaborative, socially engaged cultural intervention. Nevertheless, most of these short-lived collectives and their actions have largely vanished from the art historical narrative, just as much of the work they generated has little or no representation in museum collections (though admittedly, now and then, one or another example of this artistic dark matter is trotted out like an official dissident whose presence proves that the art world is not the homogenous monolith it appears to be). Group Material, probably the best known of these communal art experiments, is typically treated as the singular representative of 1980s art activism. Contempt for cliché-bound “political art” of past generations notwithstanding, the actual history of most activist art, Group Material included, has generally fared only somewhat better than social realism Rollins once derided. Alternatively, one could view this missing artistic matter as part of a phantom archive filled with practices and practitioners either too political, or simply too anomalous for mainstream cultural institutions to acknowledge in any complex way. But then came the Occupy Movement, charging that “the 99%” were being systematically excluded from visibility, including within the art world. The phantom archive spills open (yet again). Its dark content threatens to contaminate the sterility of white cube ideology. And refusing to acknowledge this danger is not really an option. Therefore, just as in the past, the art world haunts these occupiers and dissidents. Haunts them and hunts them, as if waiting to obtain specimens of this energetic phenomenon for its treasured vaults and repositories. Already the Whitney Museum has one or more artists associated with OWS in its upcoming 2012 biennial. To paraphrase the philosopher Gilles Deleuze, the institution is an inexorable apparatus of capture. It was no different in the late 1980s as “political art” became briefly popular in the art world and? several New York museums staged “radical” exhibitions. This, after all, is the logical way to manage dissent. Still, one must also ask, what, if any, dangerous ideas might be spread as a result of this abduction. Was not the communist modernist Diego Rivera’s waltz with MoMA and the Rockefellers also a long-range plan of infection whose canonized result can be seen in the exhibition in the very same museum. Asserting an adversarial dualism such as “we are the 99%” can be viewed as factual distortion, or simplistic sloganeering, or it might be viewed as a discursive weapon tactically wielded by the politically disempowered. Nonetheless, it is important that the movement begins to precisely define who is this occluded majority of the population. For clearly it is not merely the negation of a ruling, one percent elite. Even setting aside ideological reasons why the American working class often votes against their own economic interests, simply consider the massive investment of pension funds in the corporate sector by labor unions and the complications of the ninety-nine versus the one percentile begin to get quite complicated. Likewise, does anyone doubt that a sizable percentage of currently invisible artists would refuse success in the art world if offered just on sheer principle? Such details may appear to potentially cloud the political clarity of OWS and its slogans, but they will need to be sorted out if the movement is to remain viable in the long run. However, there is another way to look at the recent “discovery” of asymmetrical power by the Occupy Movement, one that requires wheeling-out that rusted Marxian apparatus of base and superstructure even if only as a kind of demonstration device. Rather than view this gadgetry as offering a literal explanation of the current crisis, i.e. the strict determination of cultural labor by the capitalist market system, we could visualize it in a state of spectacular malfunction as the sphere of economic activity below erupts into the realm of ideological production above. For along with revealing the obscene top-heaviness of neoliberal institutions, OWS has also underscored the utter redundancy of most workers in the present economy. This includes artists, many of whom are forced to find work fabricating, framing, transporting, or installing the work of other, more successful colleagues just to keep on making their own art. It is this sense of failure and superfluousness that may also help explain why OWS has, as a movement, identified itself with the homeless by garrisoning its General Assembly in public spaces that resembled the shantytowns of unemployed workers in the 1930s. 5See my essay: "OCCUPOLOGY, SWARMOLOGY, WHATEVEROLOGY: the city of (dis)order versus the people’s archive," Gregory Sholette, Art Journal, Winter 2011, web only edition Exemplifying these perverse divisions of artistic labor and tacit class privilege is the current lockout of Sotheby’s unionized art handlers. 2011 was a banner year for the auction house, and its CEO’s salary jumped from three to six million dollars. The corporation offered its work force a seriously compromised contract. They went on strike. Sotheby’s then set about hiring replacement workers. 6For more on the Sotheby’s strike and art market profits see: "As Stocks Fall, Art Surges at a $315.8 Million Sale," Carol Vogel, The New York Times, Nov. 9, 2011 and "Teamsters Art Handlers Picket Sotheby’s Following Lockout," Marlon Bishop, WNYC Radio Culture Page, August 2, 2011 Notably, Occupy Museums January 27 intervention linked this lockout to MoMA because it uses Sotheby’s for some of its transactions, but also because the Rivera exhibition seems to underscore the indifference of the museum to these contradictions. Nevertheless, much more difficult to convey is the way the art world depends upon the majority of its participants to remain both unseen and undeveloped, even as this same invisible multitude continues to dutifully reproduce the economic and symbolic structures that systematically exclude them. Thus far, Occupy Museums, along with the Arts & Culture and Arts & Labor working groups within OWS, have openly embraced the surplus imagination of the phantom archive of dissent?, transforming its dark matter into a bright carnival of protest. This is a significant start. But as Adorno cautioned, it’s a privilege to critique privilege. The real occupation of culture will not begin until a different set of values is developed, both between artists, and between artists, their audience and the institutions of the art sphere? And this more ineffable challenge to invisibility will require more than slogans and banner drops. Yes, unquestionably, let’s occupy the art world, or better yet, let’s do it again comrades. And then? And then?